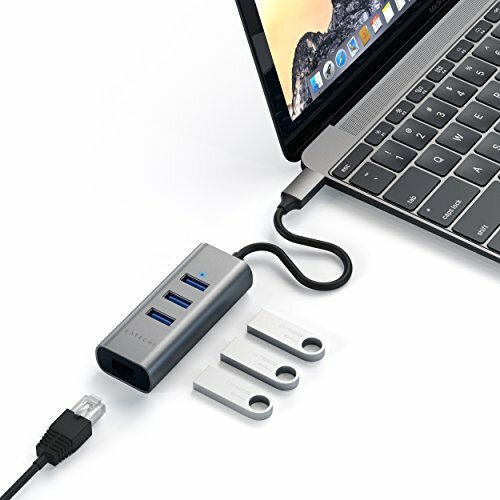 The Satechi Type-C 2-in-1 USB 3.0 Aluminum 3 Port Hub and Ethernet Port is a high-speed network solution for laptop or desktop users. It enables you to connect directly to your network via USB port, eliminating the hassle of disassembling your computer. The adapter allows you to instantly connect to a 10/100/1000 Mbps network from an available USB port on your computer. Its metallic silver finish stylishly complements Apple computers and products. Save on expensive network cards, simply use the Ethernet Adapter with any compatible USB port and enable a gigabit Ethernet network connection on your desktop or notebook computer. Computers limited to 10/100Mbps Ethernet will experience faster transfers when plugged into a Gigabit Ethernet network using this Ethernet adapter. This Ethernet Adapter supports 10/100/1000Mbps for high-speed connectivity, important for file sharing, downloads, streaming, web videos, and more. Use this Ethernet adapter to participate on multiple networks, replace damaged Ethernet ports, add a physical network connection to wireless-only systems, and replace network cards. Please note: This Ethernet adapter is not intended for use in connecting USB devices like a printer to a network.